In other words - liberals have to resort to distorting maps to gain any traction - just as they do with the truth - bend and twist it to make it "fit" their ideology. Isn't it interesting that in either case - they are rarely successful in substance - but can borrow the gullible minds of a few to occasionally win an election? Pretty dishonest - if you ask me. Why do people vote for these liberal clowns? Your post is sour grapes and garbage. And sooo yesterday. Newsflash: Romney lost, even in the popular vote. And the solid blue areas are high crime areas full of illiteracy, illegitimacy, and murderous violence. Of the 10 safest states in the U.S., nine of them voted for Obama. I didn't realize our urban cities were actually rural areas? I am not saying rural areas only go red, I am saying rural areas tend to be less populated so when someone says "look at all that red area," my response tends to be "look at how few amount of people living in those red areas." Do you really think that Vermont, Maine, northern New Hampshire, Indian reservations, and counties in eastern Iowa are urban cities. My comment stands. A majority of the LAND area colored blue is actual rural area, not "urban cities". Many suburban counties went Republican. 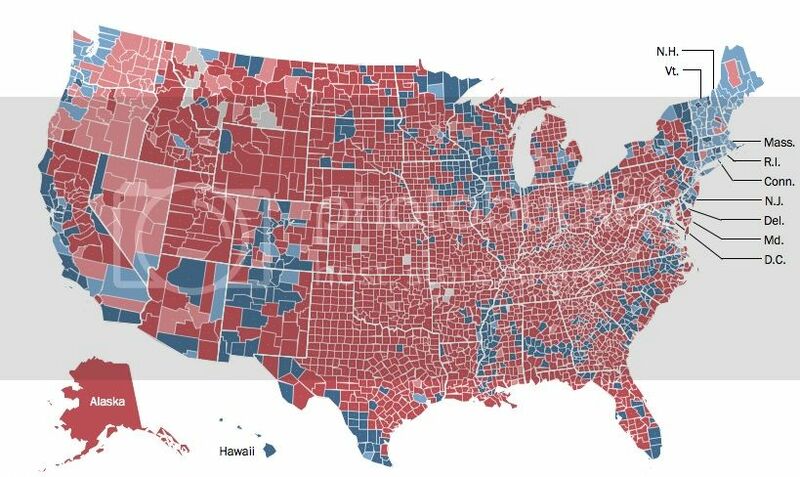 Yes, I agree that there are rural areas that went blue and yes most suburbs went red. All I said was that most urban areas went blue and that the rural areas in the middle of the country (that large area of red in the middle of the map) is rural and went red. I have driven through many of those states, it is pretty damn rural. This does not mean I think all rural went red, nor does it mean I think that all blue is urban. Try to keep up. Care to list off how many urban cities didn't go blue? Alaska is red and Hawaii is blue, pretty much no matter how you break it down. Hawaii only has five counties though, and most of Alaska is unorganized. More detailed map of North Carolina. To get the vote count just click on each individual county. I tried it to make sure it is working. Summary will come up and then you have to scroll to the right and click on map. Then click on the individual counties for the total count. Interesting map. You do realize I was raised in Virginia, Spent my adult years in the Northwest, primarily Portland, Oregon, and have only been in northern New Jersey since May and haven't been farther south than roughly Newark yet? So yeah, maybe you should first ask the question before making a dumb remark like this. I take it you didn't know. Lol! They are also the whitest. Don't you libs ever think before you link? !